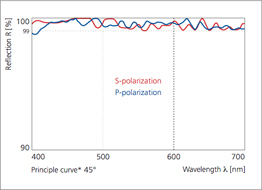 With the SHP-D series, we developed a special quality mirror coating that offers a very high broadband reflection of s&p-polarized light and at the same time a high reflectivity for a wide range of incidence angles. For a 100% dielectric coating, these are unusual characteristics because usually such kind of mirrors are designed for one or only a small range of incidence angles. We can only achieve these properties because our SHP-D coating system is consisting of a large number of thin film layers. The sophisticated coating design allows various applications which are not feasible with metal coatings like silver or aluminum mirrors. Besides, the SHP-D mirror coating is temperature resistant. They can be used at temperatures of up to 300 °C.